Is the Simplest Design the Best Design? Design is really the thing in woodworking, in my opinion. Without a good design, It doesn’t matter how good technically you are at woodworking, the piece will still be awful; it won’t look or perform right. On the other hand, if you have a great design – such as a simple mission style table, you can have a nice piece of furniture with only mediocre woodworking skills. Look at Maloof and Krenov, two icons of woodworking. I’m sure they were excellent woodworkers, technically speaking, but it’s their designs that people remember, not their joinery work (Maloof’s rocker and Krenov’s cabinet). What then, is a good design? Well, I would say that a good design, at least as it applies to woodworking, is a design that fulfills it’s purpose well, and is pleasing to the eye, such as this highboy seen here. Obviously, it can hold a lot of clothes, and with so many separate compartments, you can divide them up nicely. It’s pretty to look at, so aesthetics are certainly there, and it’s been reproduced a million times in some variation, so you know it’s a classic. My only problem with highboys is – you need a stepstool to see what is in those upper two drawers, unless you are a pro basketball player. Building a highboy, even for the master woodworker, takes hundreds and hundreds of hours. The queen anne legs, the finials, the crown, the fan carvings – all take a lot of time and expertise. Nevertheless, the classic highboy is a good design, if not a real chore to produce. So now we’ve established what a “good” design is; but what is a “great” design then? Certainly, a great design will have what a good design does – it carries out it’s purpose wonderfully, and does it while being pleasing to the eye….but it needs even more than that. In my opinion, that extra quality would be simplicity. I’ll need to explain what I mean by simplicity, and how it’s important. I think when someone comes up with a simple design, with minimal woodworking skills needed, that doesn’t depend on embellishment to make it interesting, then that designer is a genius. He’s a genius because he has created something that performs it designed purpose well, if not perfectly, and who’s design is easy to the eye, not overwhelming, a lot to see and try to appreciate. Also, the design is easy and quick to carry out technically. 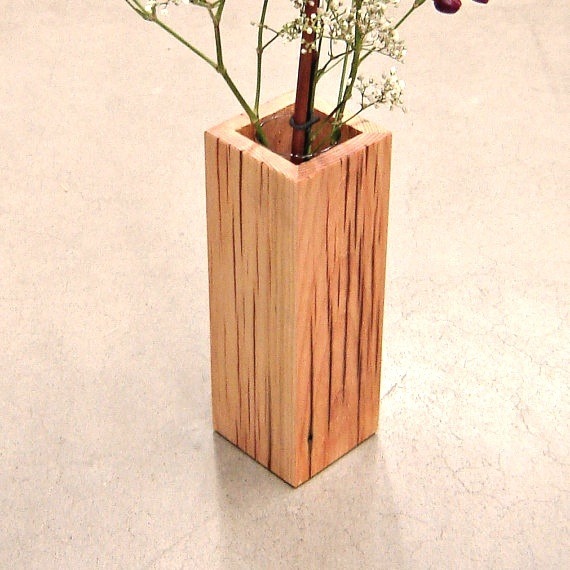 Take a long look at this reclaimed wood vase, for example. I can across this here on Etsy, by a guy that sells a good amount of work using reclaimed wood. Personally, I find this design to be even more striking then the highboy shown above! I’m sure some of you will bristle at that, but let me explain myself. FIrst, we have a design that is very simpe – essentially, an open-ended rectangular box; it must be easy, even for the beginner woodworker, to produce. Next, the beauty of the wood, a light creamy color with dark vertical streaking. No complicated beading, carving or contrasting woods. In my book, he gets bonus points for using reclaimed wood; you can enjoy the look AND know that you are being “green”. The woodworker probably paid next to nothing (if anything) for the wood. The woodworker states “Removable narrow glass vase” comes with it, so you can use water in it (as opposed to putting in dried flowers or branches, or even fake flowers). Minimal construction and finishing (he doesn’t specify a finish, there may be none) also means a positive environmental impact. Though not part of the design, it’s worth noting that this piece must be highly profitable, at $28, given the very lost cost (if not free) of materials, and the simple construction. Contrast these things with the highboy – expensive wood (probably mahogany, which had to be shipped here from a foreign country ( and is possibly an unsustainable wood), hundreds of hours of work, some type of finish, hardware, and (for me at least) questionable design because of the unreachable upper drawers. Let me again say that I think the highboy design is a very good design, no doubt, and I highly respect the skills and determination of a woodworker that can pull it off successfully; but for me, the simplicity of a design really makes a design great. Interesting post, and I understand what you’re trying to say. But I would counter with a plea for context and perspective. Your “good” and “great” classification comes with a set of values that YOU have decided are important. When I see overly fancy, very complicated furniture, with elements that require 100s of tedious hours to complete, I understand that there must be something going on there. The purpose of the design of that highboy isn’t just to have a nice looking, functional piece of furniture. The purpose of fancy pants furniture like that is for the owner (RICK people) to impress and intimidate visitors and guests to the home with their wealth. There’s no way the common man 250 years ago is going to be able to make or buy furniture like that. The stuff they had was simple, plain, and functional. There is definitely a beauty in that, but for the Governor or Magistrate or captain of industry, a plain table or chair just isn’t going to cut it; they need to show off to everyone how powerful they are. In that case, the simple wood vase would be a “bad” design for their needs, and the highboy “great”. Thanks for your points though!